A Dolmen (also known as cromlech, anta, Hünengrab, Hunebed, quoit, and portal dolmen) is a type of single-chamber megalithic tomb, usually consisting of three or more upright stones (megaliths) supporting a large flat horizontal capstone (table). Most date from the early Neolithic period (4000 B.C.E. to 3000 B.C.E.). Dolmens were usually covered with earth or smaller stones to form a barrow, though in many cases that covering has weathered away, leaving only the stone 'skeleton' of the burial mound intact. Found in many parts of the world, the numerous still standing dolmens provide an opportunity to understand the values and beliefs of those who lived long ago. Their widespread appearance attests to a certain universality in human nature, particularly with regard to death and burial. They are evidence that even early cultures had the desire and ability to transport and place these enormous stones. Requiring great planning, coordination, and collaboration for their construction, dolmens are understood as burial markers for leaders and those of significance in the society. Additionally, they served as places of ritual and worship, with many still containing funerary artifacts that indicate belief in the afterlife and the possibility of communication with the spiritual world. Dolmen originates from the expression taol maen, which means "stone table" in Breton, and was first used archaeologically by Théophile Corret de la Tour d'Auvergne, also spelled "dolmin." "Dolmen," a type of megalithic tomb, means "stone table"
The etymology of the German Hünenbett or Hünengrab and Dutch Hunebed all invoke the imagery of giants building the structures. Of other Celtic languages, "cromlech" derives from Welsh and "quoit" is commonly used in Cornwall. Anta is the term used in Portugal and dös in Sweden. Dolmens have a limited variety in their architecture. The floor plans are usually square, trapezoidal, rectangular and/or round. Some are punctuated with a portal in the center of the facade. Sometimes in front of the facade is a court that usually splays out, creating an area where rituals could take place. The court is usually outlined by large stone walls, sometimes over a meter high. The repertoire of decoration for these tombs is not usually great. Vertical and horizontal zigzags, hanging triangles, and concentric circles are the most common motifs. One decorative motif that is quite common is found across the top of the porthole slab. It can best be described as a lintel held up by two columns. Pairs of breasts, done in relief, have also been found on a few tombs. These breasts usually appear above the two columns of the porthole decoration. Perhaps related to these are the stone plugs, which were used to block the porthole, and are found with almost every tomb. Usually, dolmens were covered with earth to create a burial mound. Sometimes bodies were placed in the dolmen with artifacts; other times, the dolmens were places of cremation. The treatment of the dead is among the most significant aspects of ancient culture that archaeology studies. Apart from revealing the society's views on death and the possibility of an afterlife, in many instances it also marks a shift in cultural belief, particularly in regards to religion. Dolmens, like tumuli, are found across time and geographic boundaries, meaning that they more than likely did not spread by cultural diffusion from one originating source, but are an independently occurring phenomenon for all humankind and the development of societies and cultures. While nowhere as complex as catacombs and most later tombs, dolmens represent a large amount of thought and effort was put into treatment of the dead. Constructing such large structures during the neolithic era was not an easy task, and was usually reserved for people of significance. These structures were usually markers of reverence for people of importance, but were also sometimes places of ritual and worship. Archaeoastronomers have suggested that dolmens, like other ancient megalithic sites, contain the remnants of ancient Neolithic surveys of the Earth by astronomy. Megaliths were frequently carved and "sculpted" with figures and cupmarks (holes in the stones) to represent stars and constellations. Others, such as the Intihuatana at Machu Picchu are believed to have been designed as an astronomic clock. It has been suggested that dolmens may also include such characteristics. T-shaped Hunebed D27 in Borger-Odoorn, Netherlands. Megalithic tombs are found from the Baltic Sea and North Sea coasts, south to Spain and Portugal. 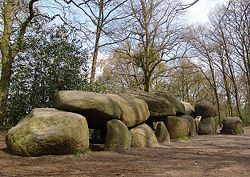 Hunebedden are chamber tombs similar to dolmens and date to the middle Neolithic (Funnelbeaker culture, fourth millennium B.C.E.). They consist of a kerb surrounding an oval mound which covered a rectangular chamber of stones with the entrance on one of the long sides. Some have a more complex layout and include an entrance passage giving them a T-shape. It has been suggested that this means they are related to the Passage graves found in Denmark and elsewhere. Dolmen da Aboboreira, Baião, Portugal. Dolmen sites fringe the Irish Sea and are found in southeast Ireland, Wales, and Cornwall. 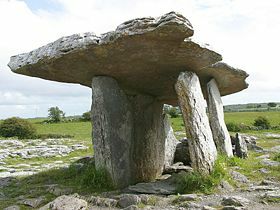 In Ireland, however, dolmens are more to be found on the west coast, particularly the Burren and Connemara, where some of the more well known examples, such as Poulnabrone, are to be found. The largest dolmen in Europe is the Browneshill Dolmen in County Carlow, Ireland. Its capstone weighs about 150 tons. Examples have also been found in northern Ireland where they may have co-existed with the Court cairn tombs. 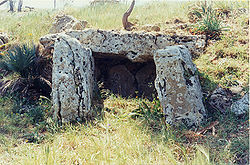 It is thought that the dolmens themselves evolved from a simpler cist burial method. Amongst the vast Neolithic collections of the Carnac stones, in Brittany, France, several dozen dolmens are found. And all around the country, several dolmens still stand, such as the ones of Passebonneau and des Gorces near Saint-Benoît-du-Sault. 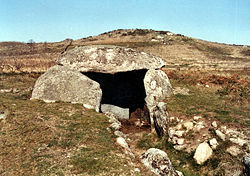 In Spain dolmens can be found in Galicia (such as Axeitos), Catalonia (like Romanyà de la Selva or Creu d'en Cobertella) and Andalusia (like the Cueva de Menga). Many dolmens can be found all over Portugal, from the more simple ones to the more complex examples of megalithic architecture, such as the Almendres Cromlech or the Anta Grande do Zambujeiro. The dolmen Er-Roc'h-Feutet found in Carnac, in Brittany, France. An inscription proclaims ownership by the state of France. In Mecklenburg and Pomerania (Germany) and Drenthe (Netherlands), large numbers of these graves were disturbed when harbors, towns, and cities were built. The boulders were used in construction and road building. However, there are still many thousands left today in Europe; for example, more than a thousand on the island of Rügen alone. In Italy, dolmens can be found in Apulia, Sardinia and in Sicily. In this latter region dolmens dating to the second half of the third millennium B.C.E. have been found in Mura Pregne (Palermo), Sciacca (Agrigento), Monte Bubbonia (Caltanissetta), Butera (Caltanissetta), Cava dei Servi (Ragusa), Cava Lazzaro (Siracusa), and Avola (Siracusa). Dolmen are generally classified in two types in East Asia: the table/northern-type and the go-board/southern-type. In the former, four stones were positioned to make the walls of a box and were capped by a stone which lay on top of the supports. The latter is characterized by underground burial with stones that supported the capstone. Korea has many of the Asian dolmens, dating from the first millennium B.C.E. Dolmen in Korea have been dated to the seventh century B.C.E. in locations such as Gochang and the practice ended around the third century B.C.E. The dolmen culture is linked with the Neolithic and bronze cultures of Korea. The dolmen in Ganghwa is a northern-type, table-shaped dolmen where ancestral rites were held. It is the biggest stone of this kind in South Korea, measuring 2.6 by 7.1 by 5.5 meters. The number of dolmens in North and South Korea, approximately 30,000, is about 40 percent of the total number of dolmens remaining in the world. The megalithic stones are invaluable because they mark the graves of the ruling elite. Pottery, comma-shaped jewels, bronzes, and other funerary artifacts have been excavated from these dolmen. The culture of the people during this time can be gleaned from the evidence left by the dolmen. Additionally, the stones show how stone was quarried, transported, and used to build dolmen. The Gochang, Hwasun and Ganghwa Dolmen Sites are the location of hundreds of stone dolmen which were used as grave markers and for ritual purposes during the first millennium B.C.E. when the Megalithic Culture was prominent on the Korean Peninsula. The sites were designated as a World Heritage Site by UNESCO in 2000. Most Korean dolmen are concentrated in these three sites. There are also dolmens in Kerala, India, about seven km from Marayoor, near the small village of Pious Nagar, also known as Alinchuvad. These dolmens are set in clusters of two to five dolmens obviously for the burial of a family. There are hundreds of such dolmen clusters in the area. Apart from overground dolmens, underground burial chambers built with dressed stone slabs are also discovered in Marayoor. All these dolmens are made from heavy granite slabs, mined using primitive technology. This was a burial ground for several centuries for a noble tribal dynasty known as Adi Cheras. Dolmen de Axeitos, Galicia, Spain. Chûn Quoit, in Penwith, Cornwall, UK. Cova d'Endaina, Romanya de la Selva, Catalunya, Spain. ↑ "Dolmen." Online Etymology Dictionary. Retrieved October 3, 2013. ↑ "Portal Tombs" BallybegVillage.com. Retrieved October 8, 2007. ↑ Luis Pericot, Santiago Alcobe, and Julio Caro Baroja "Spain and Portugal: An Anthropological Review for 1952-1954" Yearbook of Anthropology, (1955), 501-524. Retrieved October 8, 2007. ↑ "Architecture in County Carlow" Ask about Ireland. Retrieved October 3, 2013. ↑ Gochang, Hwasun and Ganghwa Dolmen Sites World Heritage Site. Retrieved August 11, 2007. ↑ "Explore Kerala" KeralaEvents.com. Retrieved October 8, 2007. Stone pages Poulnabrone County Clare. This page was last modified on 16 October 2017, at 19:36.